One of our goals at Outside Open is to pass on the love of technology to others. This summer we are offering a class on computers to Kids age 9 and over in Santa Barbara. The class is based on the Raspberry Pi single-board computer and the goal is to introduce kids to programming and creative problem solving using technology. 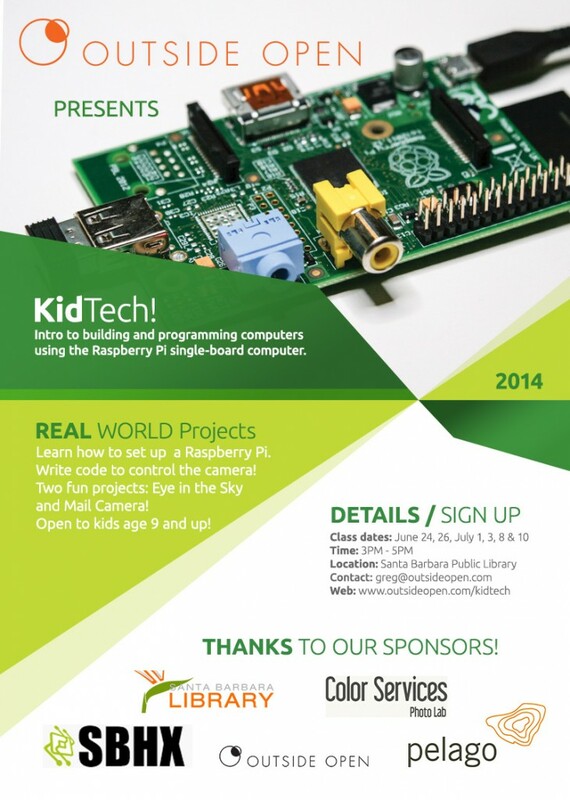 Participants will each build and program a Raspberry Pi and camera module to complete two photo based projects. Attach a Raspberry Pi to a large helium weather balloon on a very long string and program the Pi to take photos from above. Project #2 – What does the box see? Install a Raspberry Pi in a cardboard box with a hole for the camera and mail the box via FedEx while taking photos every 30 seconds. Kids will learn how to build and set up a Raspberry Pi computer, and will write an intervalometer program to take a photo every x seconds. In addition to the technical challenges, the class will also need to solve real-world problems related to mounting and packaging the equipment in a box and on the balloon, processing and compiling video from the resulting images and dealing withe the shipping vendor on pricing and logistics. There are still a couple of openings, please contact us if your kid is interested and available Tuesdays & Thursday for the next 3 weeks. This class is based on the amazing Raspberry Pi single board computer. The goal is to introduce kids to programming and creative problem solving using technology. The class is free and all necessary technology is provided by our generous sponsors. Details and resources regarding the 2014 Kid Tech classes will be posted here.